The evolution of the foil came about due to the need for a less expensive and more easily obtainable weapon for practicing techniques designed for use when dueling with the épée. In pre 19th century Europe, fine steel was rare and rather expensive. To risk damaging one's fine épée while practicing was impractical which lead to the creation of the practice foil made from sheets of less expensive rolled steel foil. The foil is equal in length to the épée but the diameter of both the blade and the guard are smaller making the weapon lighter and more flexible. Like the modern épée, the modern electric foil has a small button on the tip to simulate a sharp point. A modern foil fencer also wears a special electrically conductive vest, called a lamé, that covers the torso, front and back which represents the valid target area. To score, the fencer must depress the button against the lamé on the opposing fencer. At least 500 grams of pressure is required to depress the point of the electric foil which is lighter than the 750 grams required for the épée point. Because a foil fencer is never in any actual physical danger due to the weapon's blunted point, there is no compelling reason to attempt a defensive maneuver when under attack before launching a counter attack of one's own. To counteract the natural tendency to forego defense when no actual physical injury is at stake, rules for foil fencing were developed to require defensive action by the subject of an attack before a touch can be scored by the attacked fencer. 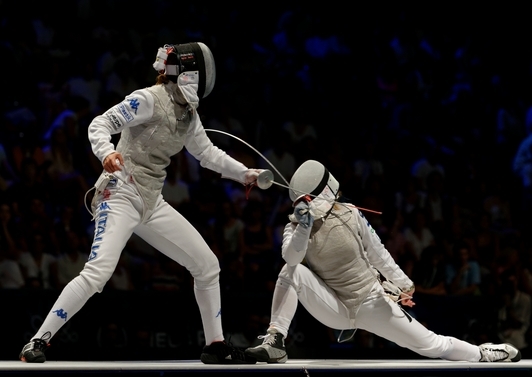 Unlike with the épée, only one of the opponents can ever be awarded a point on any given touch regardless of whether both fencers hit at the same time. This concept is manifested in what has become known as priority or right-of-way. A fencer is said to have priority when they are either the first to begin an attack or, they have successfully defended against an attack initiated by their opponent. There is a single exception to the priority requirement which occurs when the fencer who does not have priority launches a counter attack that lands while the fencer who had priority fails to land their touch. However, should the original priority attack land in any manner, the counter attack is always disqualified and the touch awarded to the fencer who had priority when the touch occurred. Foil fencing can be very tactical and precise in style with many eloquent attack/defense phrases occurring in top level bouts. Accuracy, planning ahead and the ability to think on your feet are all important elements of the discipline that is modern foil fencing.